“The Substance of Things Hoped For” is a dreamlike mood-piece juxtaposing a ruined Earth with a pure and innocent bipedal unicorn maiden. “The Clockwork Cat” is in the form of classic fairy tales; a mechanical cat and the fairy Queen of the Cats bring joy to a young girl in a medieval European setting. In “Sawyer”, a gonzo s-f comedy, a Mad Scientist experiments with exploding chickens to create a horde of anthropomorphic feline perfect secretaries, just like Sawyer in the movie “Cats Don’t Dance”, for the modern business executive. “Fox Hunt” is a more traditional s-f drama; a battle of wits between a wheelchair-bound security manager with an army of robot sentries versus a lone bioengineered fox-morph industrial thief. In the fantasy “Festival of Masks”, a man walks into a strange bar just as its patrons prepare to celebrate the Festival of Masks. This is one of two stories here whose ending is predictable, although it is still well-written. “Wild Carrot”, the other predictable story, is a comedic parody of the werewolf-horror formula; you can guess what the cursed human will turn into. “A Fairy Tale” is a satiric private-eye adventure in a world of magic; two human detectives and their fairy assistant are hired to keep a Redcap from molesting a female pooka. “My Pretty Pony” (published in April 2009; My Little Pony: Friendship is Magic did not premiere on TV until October 10, 2010) should be required reading for every Brony. It is a chilling prediction of how, if the MLP:FIM ponies became real, it would lead to the end of human civilization. “Night Mares”, “Storyteller”, “Lair of the White Rabbit: A Collection of Unexplored Vignettes”, and “Pick’s Model” are four more short-shorts; two dreamlike mood-pieces and two anthropomorphic in-group tributes to Loewen’s friend and sometimes collaborator, Furry author Ken Pick. “Coventry House” is the last, the longest, and the most serious story here. Published in 2001, it is a “philosophical cousin”, or early version, of Loewen’s Yew Manor (published on Smashwords as an ebook in 2012); but the two versions are different enough that they can both be enjoyed. Molly Ladanyi, an introverted scholar of antiquities who imagines that she is a hard-headed realist, is invited to a secluded English country house where the other guests are cat-headed Bast, stag-headed Cernunnos, Reynard the French trickster-fox, Näkki, an anthropomorphic horse, and their ilk. Loewen gives a religious/science-fictional rationale for the existence of these Nephilim, living in hiding in the modern world. Molly is gradually won over to them, but Loki causes problems. It is good to have some of Loewen’s best stories in this handy book form. 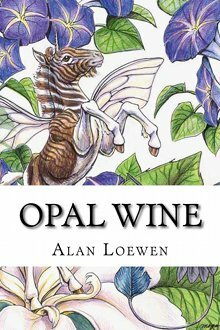 Opal Wine has an attractive cover by Megan Giles. After Loewen sent me this review copy but before it arrived, I got a warning e-mail from him. Yesterday, one of the purchasers of the Opal Wine collection emailed me to complain about the numerous typos and grammatical errors in the book. This caught me by surprise and after research, I discovered that CreateSpace has been publishing and mailing the original uncorrected proof. Unfortunately, the hardcopy that is on its way to you is one of those copies. The actual manuscript was gone over by three separate editors [and] within 48 hours, every copy purchased from here on out will be the corrected manuscript. Unfortunately, the Kindle version of Opal Wine is going to take a little longer due to the way Apple allows documents to be replaced. This is the second CreateSpace book that I know of whose author has complained of finding out that CreateSpace has been printing and selling the original, uncorrected file rather than the proofread and corrected file. The paperback copies of Opal Wine ordered by this time should be the corrected versions. I do not know whether the Kindle edition will have been corrected yet. Fred, thank you for a very kind review. I'm glad to announce that both the paperback and Kindle version are the corrected finals. However, I am committed to 100% error free stories. Should any of my readers find a mistake, please let me know. My email address is available in all of my works. Here's to more stories, furry and mundane!